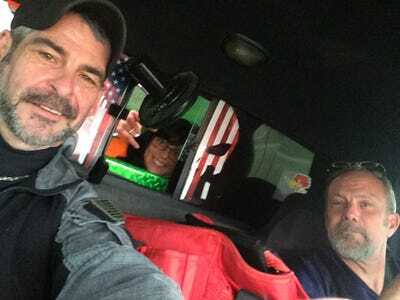 A Pennsylvania trio drew national attention Tuesday when they were arrested en route to Manhattan toting a cache of loaded guns, knives, and body armour. The New York Police Department quickly dispelled the possibility that the suspects were connected to terrorism. Instead, the group told authorities they were anti-heroin activists on an alleged mission to rescue a teenage girl from a heroin dealer in a Brooklyn hotel, CBS reported Wednesday. John Cramsey, 50, Dean Smith, 53, and Kimberly Arendt, 29, are due to appear in a New Jersey courthouse Wednesday. Each is facing charges of illegal possession of guns and ammunition, according to CBS. 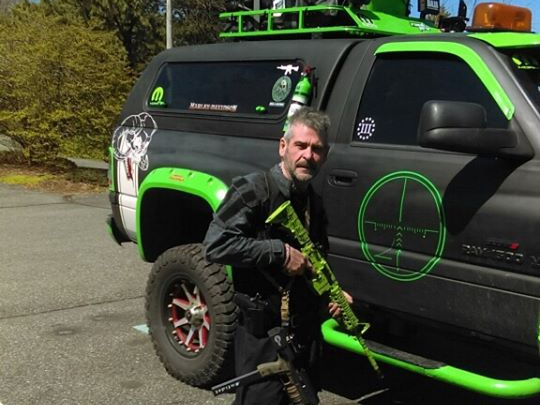 The trio had not been subtle about their mission — police said they first spotted the group driving into the Holland Tunnel, which connects New Jersey to New York City, in a lurid green-and-black pickup truck decked out in decals, emergency lights, and an image of the Constitution. The suspects were affiliated with a local anti-heroin group called Enough is Enough, co-founded by Cramsey after his 20-year-old daughter Alexandria died of a heroin overdose in February, the Washington Post reported. Both Cramsey and Arendt are members of Enough is Enough, and Smith reportedly joined the pair to film the rescue. Cramsey had even posted about the mission on the group’s Facebook page shortly before his arrest. The trio had been alerted to the girl in Brooklyn by Arendt’s mother, Michele Plocinik, who told the Post her daughter had received a text message early Tuesday from a teenage girl in New York City who said she was on heroin and in trouble. Cramsey, Arendt, and Smith’s arrests were a “big misunderstanding,” Plocinik told the Post.